India-Australia Test matches have attracted as much if not more attention than the Ashes itself. in recent years. The two giants of the cricketing world have given us unforgettable games this century, and we are set for yet another mouth-watering series to come this month. Although such high-profile encounters usually do not always warrant the introduction of a new name, India-Australia series' have been an exception. Both teams have not held anything back and have unleashed debutants against each other quite often. Australian greats like Steve Waugh and Bruce Reid made their debuts against India in Tests. They went on to become legends in their own right later on in their Test career. Here, we take a glance at five prominent Indian players who made their debuts against the Aussies. The "Turbanator", as he is fondly called made his Test debut against his favourite opposition, Australia in the third Test of the Border-Gavaskar trophy in Bangalore in 1998. Interestingly, the current Australian coach, Darren Lehmann also made his Test debut in the same match. 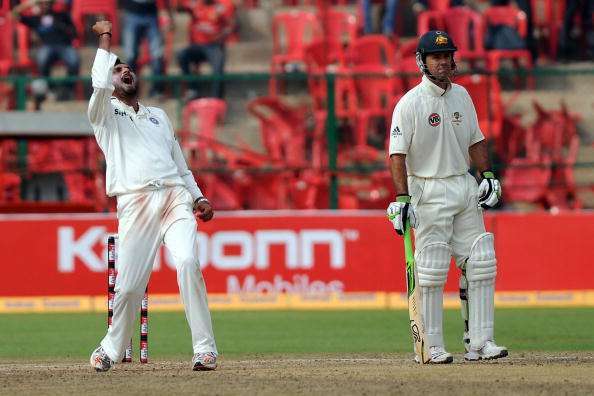 Harbhajan joined Anil Kumble and Venkatapathy Raju as the third spinner in the side. The then young off-spinner dismissed Greg Blewett and Darren Lehmann in the first innings to finish with figures of 2/112 while Kumble grabbed a six-for. The lanky lad from Punjab bowled four wicketless overs in the second innings as Australia easily chased down a target of 194. However, the off-spinner would go on to have some great games against Australia the next time they toured India.